It's relatively common knowledge that Rei is associated with the Moon. I have also heard the notion that Rei refers to herself in the line "a woman who does not bleed," and means that she's sterile. Given the temporal similarities of menstrual and lunar cycles, could there be a triple parallel? Is this why the Black Moon bleeds in EoE, or why the stream of blood coming out of Uber-Rei's neck seems pointed at the moon? Or is this just the Dextromethorphan skrewing with my head? ... I don't think it means she's "sterile" necessarily. She's fourteen ... she just hasn't gotten her period yet, you know? Jeeze! is this what the makers of feminine hygene products refer to as "heavy flow"? "Don't mind me, I've been doing this for billions of years..."
Shin, your ability to notice stuff like that is completely inhuman. Just why were you looking at Rei's crotch in that scene anyway? Additionally, I heard that in Judeo-Christian mythology, Armisael was the angel responsible for (among other things) pregnancy and childbirth. This meshes with Zerogouki appearing "pregnant" during its final battle, and with the Armisael/Rei bleeding in Shin's lovely screencaps. For those of us who subscribe to the idea that Rei survived that fight (and I have new evidence for that, BTW) as a result of the fusion, and that Armisael is still hidden somewhere deep inside Rei's mind and is who Rei talks to in episode 25, this could mean that Armisael could have given Rei a "gift" of fertility. This may be a factor in Rei's betrayal of Gendo in EoE. I thought we had established that Rei 2 is talking with Armisael alone...? I just don't see how Rei 1/EVA-00 factors into the conversation, the usage of the deformed Rei 1 "laughing face" aside. 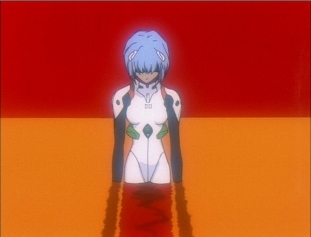 Rei herself lets us know that the voice she hears is neither hers nor the "myself within Eva". This is one of those things that I picked up on a while back, but never really thought of mentioning on the forum. On an aside, how can she be leaking like that with the plugsuit on? Technicalities, technicalities! If it's THAT bad, they'd probably recommend going to the hospital immediately. Who? Armisael? Rei? Or Lilith? It's possible that Lilith was only bleeding like that after being separated from Shogouki. If she'd been doing that for billions of years whilst buried inside the Black Moon, where the hell would it all go?? Oh, there you go again... How many times have I had to check translations for you now? Chi no nioi. Chi o nagasanai onna. Akai tsuchi kara tsukurareta ningen. Otoko to onna kara tsukurareta ningen. The scent of blood. A woman who does not shed blood (i.e., bleed). Humanity, made from the red soil. Humanity, made from man and woman. If you're looking for possible idiomic uses of nagasu (pour, flow, shed, etc.) here, I'm pretty sure they don't exist. Following the line "the scent of blood", it makes perfect sense that Rei is speaking quite literally about bleeding. So... deal with it! Fuzzy Chickens wrote: Shin, your ability to notice stuff like that is completely inhuman. Just why were you looking at Rei's crotch in that scene anyway? It's not a matter of staring at her crotch, it's a matter of seeing something funny floating in the water and tracing it back to its source. I think you need to take into consideration that "Moon", in NGE, also refers to the two "seeds of life", the Black Moon and White Moon... Both of which originally held a source of life, so any derivative lifeform could ultimately be traced back to the relevant "moon". Not sure what point I was going to make with that, though. Additionally, I heard that in Judeo-Christian mythology, Armisael was the angel responsible for (among other things) pregnancy and childbirth. This meshes with Zerogouki appearing "pregnant" during its final battle, and with the Armisael/Rei bleeding in Shin's lovely screencaps. EVA-00's "pregnancy" is really just Armisael's biomass after being absorbed into the core and 'converted' into that blobby pink crap... I have no idea how that's supposed to tie into Armi/Rei's bleeding, though. The script tells us that she is talking to Rei 1 there, not Armisael. this could mean that Armisael could have given Rei a "gift" of fertility. 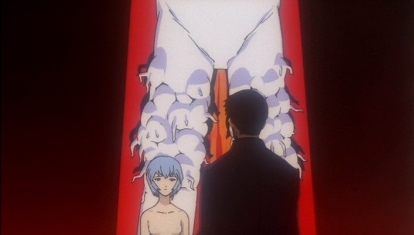 This may be a factor in Rei's betrayal of Gendo in EoE. You come to some interesting conclusions... In my oh-so-insignifant opinion, though, they're pretty "out there." It's not really a conclusion, just speculation. Even I don't think there's much to support it. I refer to Zerogouki's "pregnancy" as such because that is what it resembles. The abdomen becomes swollen and very rounded, but the rest of the body maintains its normal size and shape. I think it's just too similar to be a coincidence. In the script for Episode 23, what name is given to the menstruating Armisael in Rei's dream sequence? ... yeah ... as far as that matter goes, even I (with my "crazy" [compared to accepted beliefs here] ideas) can't support you on that one. Prepare for contraversy (this isn't technically meant to stir debate — I'd like to just open a Fundamentals of Eva thread later this weekend, since I'm finding that many issues discussed end up falling back on other issues that come first ... and it all just becomes a big mess ...) — but I digress. As I was saying about the quote. How is it that if Rei contains the soul of Lilith that she's able to talk to "Rei I"? Wouldn't they be the same person? Unless of course my theory's correct in that Rei I, II and III are all individuals with individual souls (though I must submit that there is some thing which connects them — what that thing is, is merely speculation on my part, but not a matter for debate in this thread). We see all the characters talking to themselves in Episode 25, and I'm pretty sure each of them had only one soul. It could be that Rei 2 is sterile in her human form but not in her Lillith form. In #23, Rei 2 hovers above the LCL, as if such things don't "touch" her. Fuzzy Chickens wrote: I refer to Zerogouki's "pregnancy" as such because that is what it resembles. The abdomen becomes swollen and very rounded, but the rest of the body maintains its normal size and shape. I think it's just too similar to be a coincidence. The ABDOMEN does not become swollen; it remains under the armor, same as always. What you are referring to is the growth that breaks out of the core. The rather ambiguous "Rei no koe" -- "Rei's voice" or "Rei voice". It could imply either that the voice IS hers or that it merely sounds like hers. Fun, huh? Knives wrote: Prepare for contraversy (this isn't technically meant to stir debate — I'd like to just open a Fundamentals of Eva thread later this weekend, since I'm finding that many issues discussed end up falling back on other issues that come first ... and it all just becomes a big mess ...) — but I digress. Well, you could always go and read old threads -- heaven forbid! Fuzzy Chickens wrote: We see all the characters talking to themselves in Episode 25, and I'm pretty sure each of them had only one soul. But when the other characters talk to themselves, I don't think their various incarnations are given numberical designations. Well ... if you go back to May, I'm commenting in practically every thread from April through May 15th-ish. The point I was making is that in regards to the matters under discussion, talking about each one seperately, simultaneously accomplishes little, considering that so many of said topics are inter-connected and depend on the foundation of one another. For instance, currently, I believe I've been posting in at least four if not five topics (mainly with you, I believe, Reichu) — though I've cut back the last couple days given other taks outside of Eva debate ( ). But you can see how successful that's been. Arguing five things at once does not constitute for a coherent and thoughtful discussion. I was discussing this with Wigs back in May as well, before losing access to the internet. Rather than get into it now, I'll just say in regards to the translations ... I'd assume I'd have to know more about how the language works in order to understand the intracacies of "tamashii" and "kokoro" if such intracacies do exist. Were I to discuss the issue now, I would take a position which would argue that one may — and should — use mind and soul practically interchangably. Though I will grant that perhaps, given that my education in philosophy does not encompass the Japanese tradition, some of what I understand, may be different from common Japanese understanding. But even given that, it doesn't negate having room for discussion on such matters. But again ... another time ... another more "coherent" thread . Reichu wrote: The ABDOMEN does not become swollen; it remains under the armor, same as always. What you are referring to is the growth that breaks out of the core. I could have sworn that the aforementioned "growth" eventually went away, and the big bulgy pregnancy-looking thing was something completely different.